Victoria ASBC Public Talk, Tuesday May 17: Locarno Houses?! 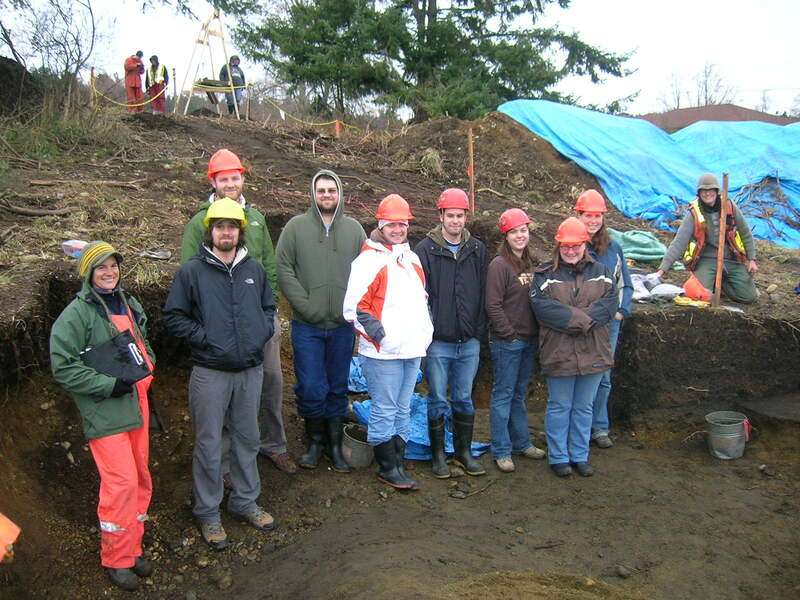 UVIC students visiting "Aquattro Site" near Esquimalt Lagoon, 2008. The next scheduled public talk of the Archaeological Society of BC, Victoria Chapter, will be held next Tuesday evening at 7.30 at the Pacific Forestry Centre, 506 West Burnside Road (map). The talk is free and open to any member of the public. The talk is entitled Preliminary Investigation Results from DcRu-1151: A Locarno-Age Living and Processing Site at Esquimalt Lagoon, and will be given by local archaeologists Kristi Bowie and Kira Kristensen. I had the pleasure of visiting this site while it was being excavated a few years ago. All signs were that the site included the remains of a house dating to between 2500 and 3500 years ago, the “Locarno Beach” period, though at that time the feature was not directly dated. Very little is known of domestic structures from this time and so the finds could be quite exciting. I’m looking forward to hearing more about this site, though it is doubtful I will be able to attend this talk due to the ongoing circumstances which also keep this blog running slowly. I am pasting in the abstract and speaker biographies below, or else click here for the PDF. ABSTRACT: DcRu-1151 is located approximately 500 m inland from the Esquimalt Lagoon in Colwood, B.C., in the vicinity of the new Aquattro townhouse and condominium development. Archaeological investigations were conducted by I.R. Wilson Consultants Ltd. (now Stantec) in late 2007 and continued until Spring 2008. Investigations into the site revealed what is anticipated to be a Locarno Phase semi-subterranean house-floor containing a carefully constructed hearth. Adjacent to this a second smaller semi-subterranean feature containing an unusual clay- and rock-lined oven or hearth. These features are believed to be unique to the region. DcRu-1151 shares a contemporaneous time frame with DcRu-74, located within 500 m southeast of DcRu-1151. DcRu-74 is believed to be the only known Locarno-period wet site on southern Vancouver Island. This talk will discuss the spatial distribution of these unique features as they offer a unique opportunity to explore the construction and use of Locarno-age housing. We also hope to encourage dialogue about their function. Kira Kristensen is a professional member of the BC Association of Professional Archaeologist (BCAPA) and has been working in consulting archaeology since 2000. She has supervised and conducted extensive archaeological surveys, impact assessments and excavations in British Columbia from the northeastern portions of the province to Vancouver Island. Originally from Vancouver Island, Kira is happy to be home and living in Port Alberni, BC and is enjoying working for Madrone Environmental Services in Duncan, BC. Kristi Bowie is currently a fulltime graduate student at UVic completing her MA in Anthropology. For over eight years she has been consulting in archaeology, paleontology and forensics for organizations including the RCMP, American Museum of Natural History and most recently several years with I.R. Wilson Consultants Ltd., now Stantec. Kristi’s MA studies are centred on the issue of Indigenous children who are considered missing and reputed to be buried in unmarked burial and cemetery sites associated with former residential schools in Canada. This entry was posted in Archaeology, Cultural Resource Management, fieldwork, Northwest Coast, Vancouver Island and tagged ASBC, CRM, Cultural Resource Management, Esquimalt, household archaeology, Salish, Songhees, Straits Salish. Bookmark the permalink. anyone know if this project was ever completed and a final report submitted to the archaeology branch?